In line with forward-thinking kits over the last 20 years, this unique head-to-toe look includes Nike’s first women’s-specific integrated soccer cleat collection. Also new for this tournament, the replica of the women’s specific uniform will be available in men’s sizes, allowing all Americans to proudly display their support for the women’s team. Designed specifically as an integrated look with the new tournament cleat collection, the uniform combines fresh inspiration and modern style to deliver unrivaled performance and a lower environmental impact. Each piece of the kit – the jersey, shorts and socks – is constructed with recycled polyester, which is made from recycled plastic bottles that are melted down to produce fine yarn used to create the fabric. Each kit is made using an average of 18 recycled plastic bottles. Since 2010, Nike has diverted more than two billion plastic bottles from landfills into recycled polyester – enough to cover about 3,500 football pitches. By using recycled polyester Nike is also reducing the energy consumed in the manufacturing process by up to 30 percent compared to virgin polyester. 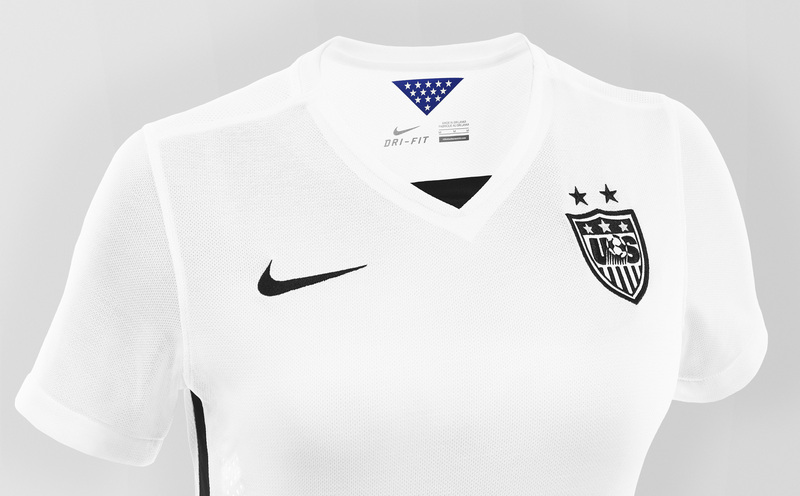 Nike designers created the brilliant white kit to make a strong visual impact on the field. A contrasting stripe runs down the side of the body, through the jersey and shorts, to accentuate player movement. A white-to-volt gradient in the socks draws the eye to the feet and the ball. The simple, classic aesthetic belies the uniform’s innovative features. 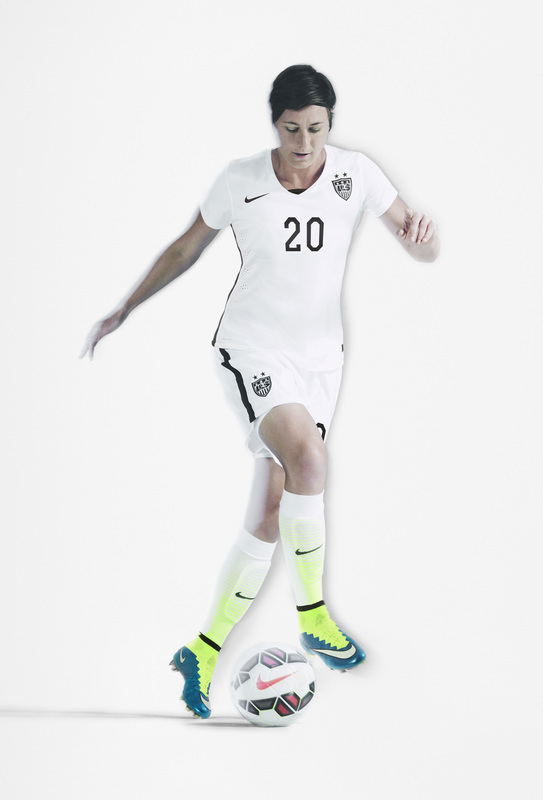 Informed by 3-D body mapping, the 2015 USWNT home uniform features a new, fully-articulated women’s-specific fit to maximize natural movement, comfort and performance. The dual-knit cotton and recycled polyester fabric provides a softer feel. Weighing in at 16 percent lighter than previous kits to help maximize speed and comfort, it also has a breakthrough cooling system integrating multiple technologies to regulate athlete temperature. Nike Dri-FIT draws sweat away from the body to the exterior of the shirt and shorts where it quickly evaporates. Laser-cut ventilation side holes and strategic mesh paneling, including a full-mesh jersey back, increase air circulation and thermoregulation. Two stars stitched above the U.S. Soccer Federation crest proudly signify the USA’s two World Cup victories in 1991 and 1999, while a black triangular insert punctuates the new streamlined, modern V-neck collar. The names and numbers on the back of the shirt feature an angular, modern typeface, that is a modern twist on traditional American collegiate-style graphics and designed specifically for the US Soccer Federation. 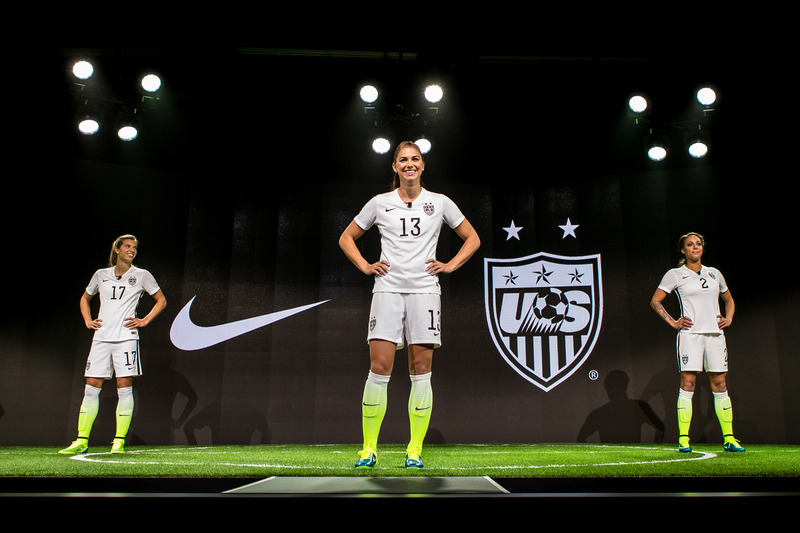 For the first time, Nike also created a tournament pack of women’s footwear, that includes all four of Nike’s cleat types – Mercurial, Magista, Hypervenom and Tiempo – in a stunning color combination designed in concert with the USWNT home uniform. The cleats combine flashes of Volt yellow with a striking ‘Blue Lagoon’ color, a nod to the famous lakes of tournament host nation Canada. Nike Elite Match socks, engineered for comfort, protection, and support are primarily white, with a Volt gradient that visually connects to the cleats. 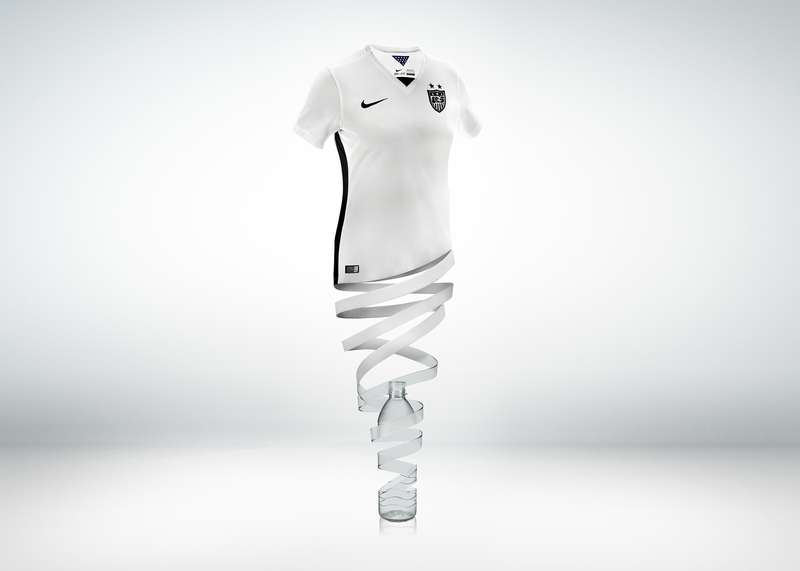 Nike and U.S. Soccer are committed to innovating for all of the squad’s performance needs. The soccer-specific system of dress features a Nike Pro Combat baselayer and new performance sports bra, while the Nike Pro Combat Ultra Light Slider Short is designed for soccer-specific protection and breathability. The extended product collection also includes a full range of training apparel, as well off-field press and travel looks for the players. The USA jerseys are available in women’s, men’s, and youth sizes exclusively in the Nike Soccer App(gonike.me/SoccerApp) on April 22nd and will be in Nike stores and on nike.com from April 23rd. 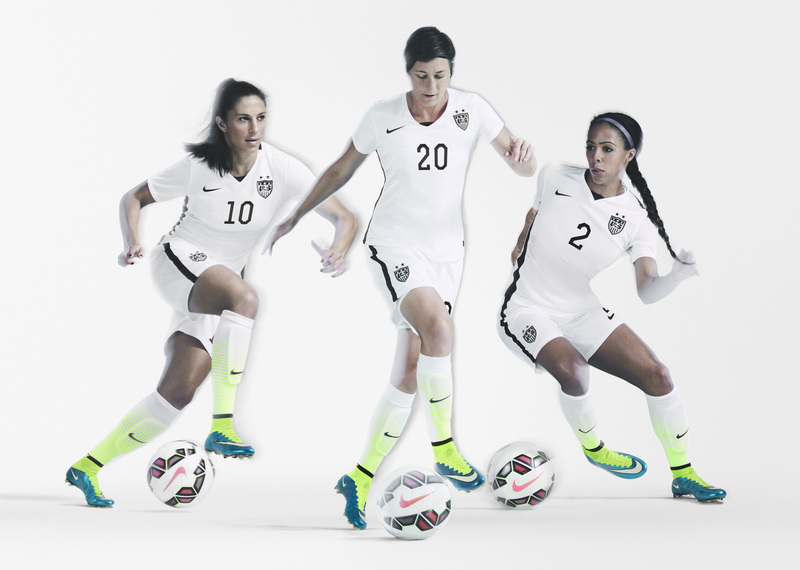 What do you think of the Nike United States women’s football kit? Let us know in the comments section below or on our Twitter and Facebook pages.